Thank you so much for all the lovely entries so far! We know that this month's theme is a bit tricky, but you did such a great job! 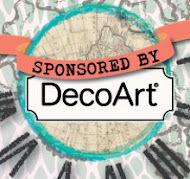 Time to announce this month's prize sponsor and to shine a spotlight on one of the fab entries so far. To get the chance to win this wonderful prize package all you have to do is enter this month's challenge with a Steampunk project that follows the theme "Transparency" and our general challenge rules. 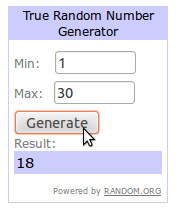 Random.org will help select a winner from all proper entries and we will announce it shortly after the challenge has ended. 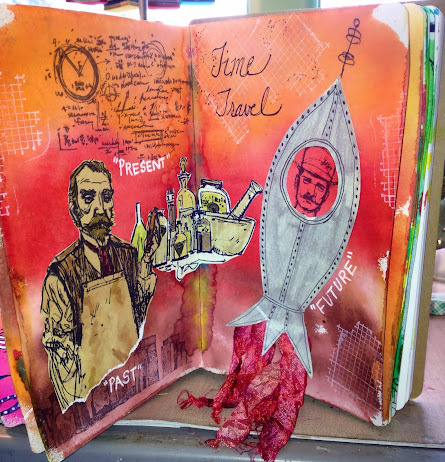 Thank you so much, Angela, for sharing this awesome journal spread with us! I love every detail - the background, the doodled frame, the colours and the transparent submarine! So cleverly done and such brilliant story telling! Please, feel free to grab the badge for your blog! It is time again to announce our winners and Top3! We all hope you are doing fine and enjoy your creative journeys and of course look forward to seeing you enter our March challenge "Transparency"! We loved all your entries and were once again blown away by the imagination and creativity shown with all the wonderful projects! Thank you all so much to all our players who make this challenge blog so very special! We are impatiently waiting to see what you will enter for the (really tricky) "Transparency" challenge this month! 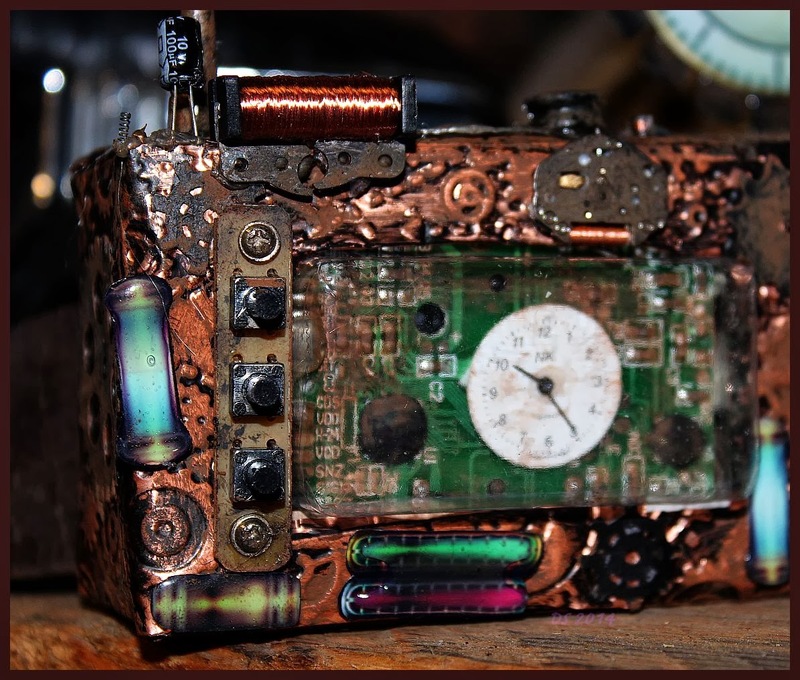 The challenge will be open until the end of the month and by entering it with a project that is steampunk and follows our challenge rules you get eligible to win a wonderful prize from one of our sponsors, make the Top3 or become spotlighted. If you want to be with us as a Guest Designer just add a "GD" to your name when entering our challenge via inlinkz. We will contact you then. 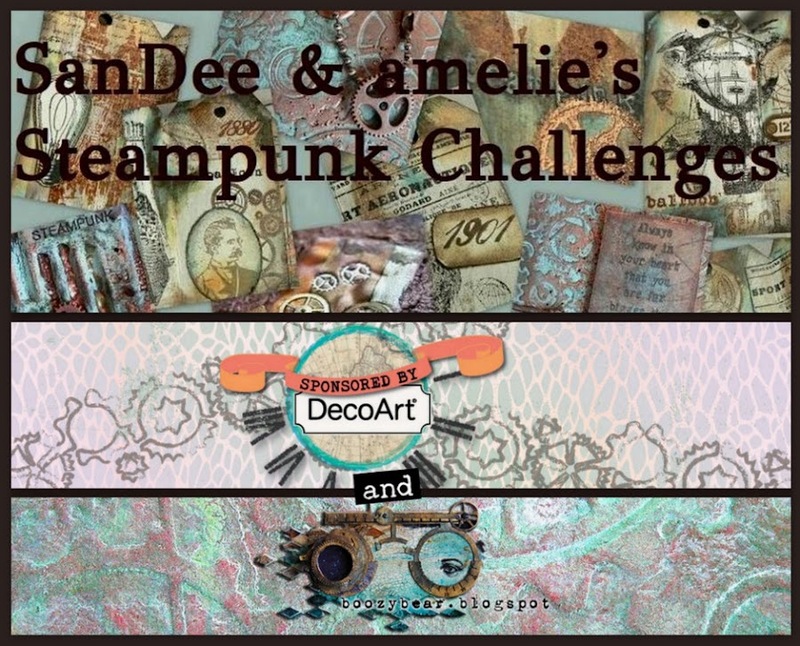 Servus and welcome back for another edition of SanDee&amelie's Steampunk Challenges! 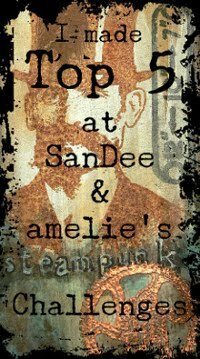 So great to have you back for some more Steampunk play! For a start we want to share with you the latest news: our new design team members! As life has become more hectic than expected for some of the "old team" we decided to get some backing so we will always have enough inspirational stuff to provide you with at each start of a challenge. And luckily both said yes - so, please, welcome to the team Susan Janicula from "klistersøster" and Agnieszka, better known as Meresanth, from "Meresanth Krafts"! Applause, applause! I've been blogging for 1 ½ years now, and has participated in a variety of challenges. It has given me some real good moments. When I discovered Steampunk I was sold for gears - gadgets ... I was very honored when die Amelie asked if I would be DT member, and I am looking forward to be contributing to the team. My crafting adventure started with jewellery-making a few years ago, but I have developed a strong love for paper since then and now mainly make paper and metal projects. I've always been drawn to all things vintage so I guess steampunk has been waiting round the corner for me all these years... I'm so glad I finally found it! We are so happy to have them with us now and they made some brilliant projects for their first appearance here on the challenge blog! This means you can use transparent or semi-transparent materials or objects with your makes or even make "transparency" the main theme of your project. 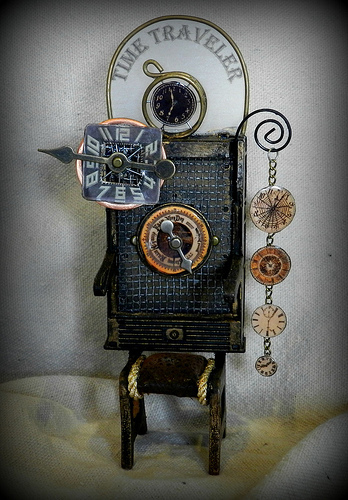 We leave it all up to you as long as your make is obviously steampunk AND follows the challenge rules too (which can be found at the top of the blog). As always there's a prize to be won and the possibility that you will get featured as our spotlight during the month...or even make our Top3. Please, enter your makes at the bottom of this post using one of the two inlinkz-collections (for 2D or 3D makes). If you want to be our Guest Designer just add a "GD" to your name when entering your project. We will contact you then. Hallo, mein Name ist Kerstin. Ich komme aus einer kleinen Stadt in Sachsen-Anhalt, Deutschland. Probiere immer gern alles Neue aus, so begann ich mit Acryl- und Textilmalerei, dazu kam die Decopagetechnik, Kerzengestaltung, Stempelkunst und Scrapbooking. 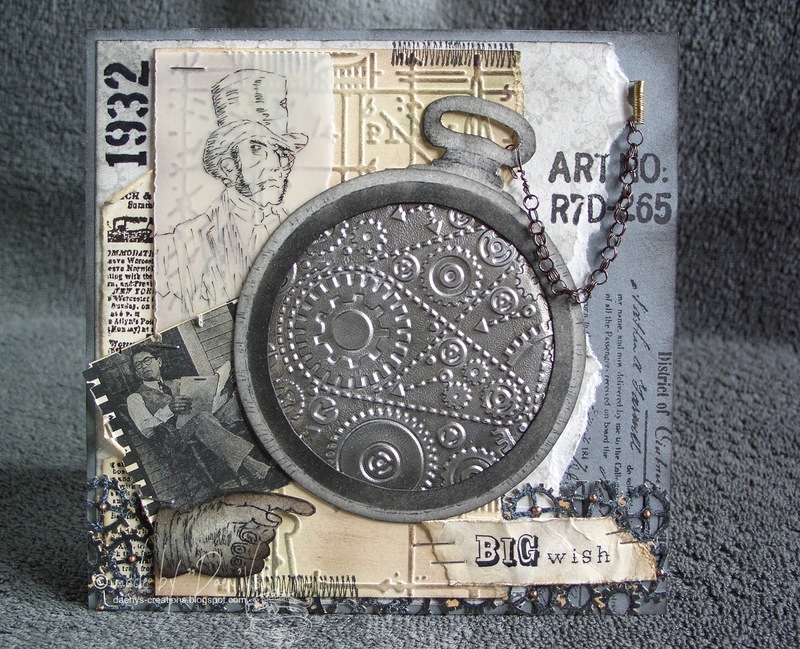 Favorit ist für mich die Mixed Media Art im Vintagestyle, hier läßt sich alles kombinieren. Aus alt mach neu, deshalb wird auch gern mal auf Opa's Dachboden oder immer Keller gekramt, die Dinge haben Geschichte! Kreativ zu sein heißt für mich, mich selbst und eine neue Welt zu entdecken, den Ideen freien Lauf lassen, um am Ende selbst zu staunen, was daraus entstanden ist. Hi, my name is Kerstin. I always like to try everything new, so I started with acrylic and fabric painting, came to the art Decopage, candle design, stamp art and scrapbooking. So virtually everything that has to do with my passion for colors. 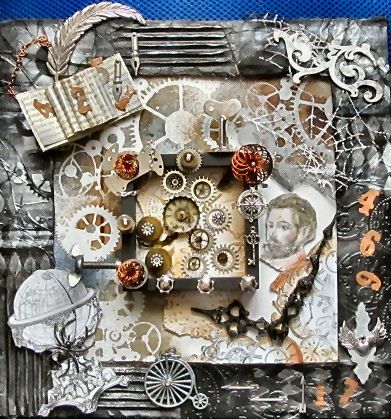 Favorite for me is the Mixed Media Art in vintage style, here everything can be combined. From old to new, so is also often dug out on grandpa's attic or basement always, things have history! To discover myself and a new world, let the ideas flow to marvel at the end itself, which has been incurred for me to be creative means. Thank you so much, Kerstin, for being with us this month! Your project is so awesome and you really rocked the challenge theme! Check out this close up for all the yummy details! Wow! 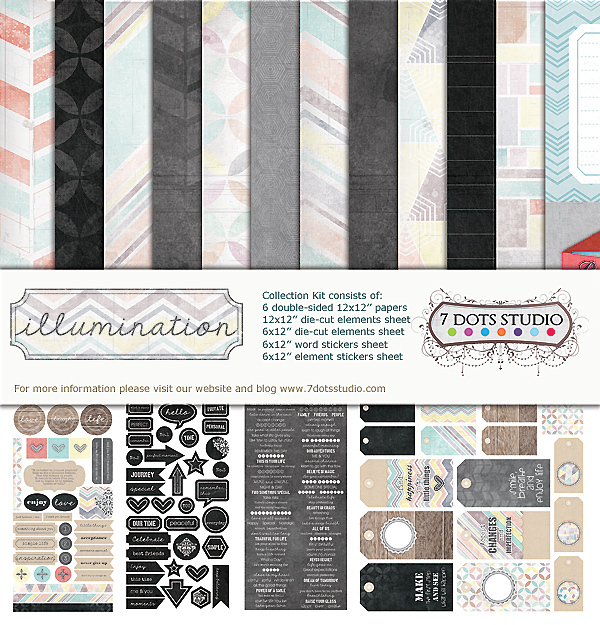 To learn more about Kerstin's fabulous make hop over to her blog (by clicking her blog name above)! 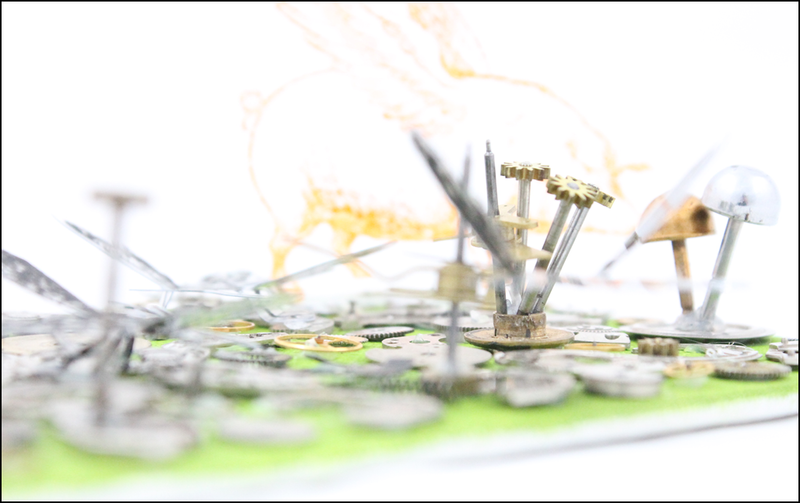 A steampunk meadow with flying creatures. 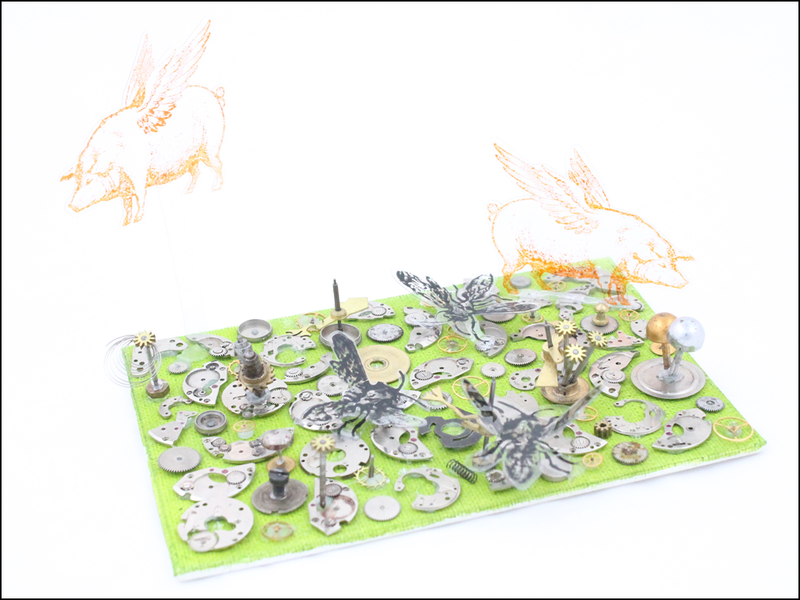 :) Created on canvas with clockwork elements and animals stamped onto acetate and cut out - the pig is 'flying' on an acetate strip. The blog post will be here. 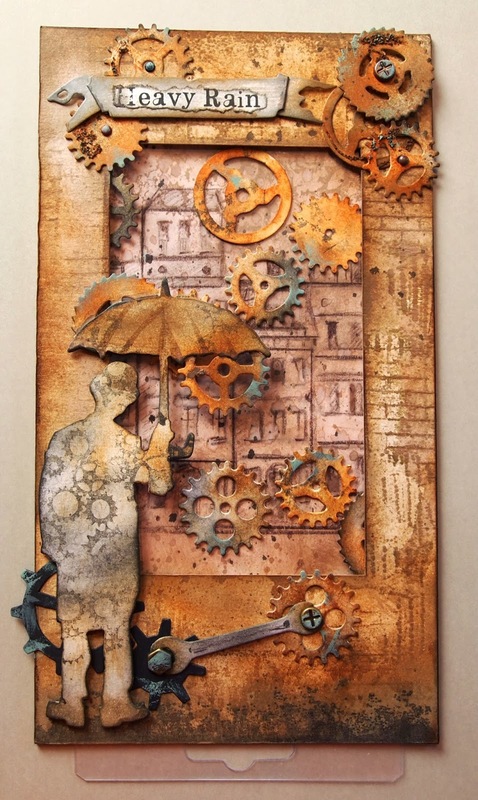 I've made this card Heavy Rain with the gears on transparent acetate. 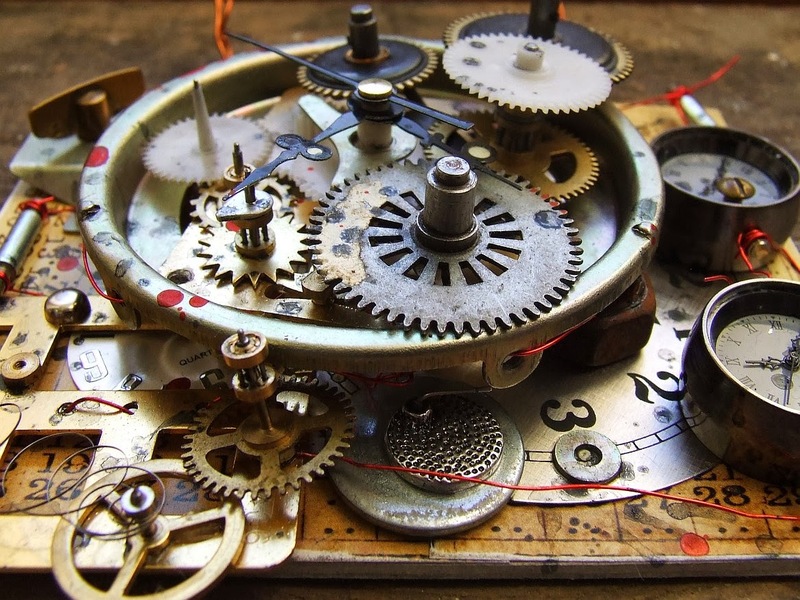 When you pull the acetate the gears will move downwards. See more pictures and how I've made it on Heavy Rain. 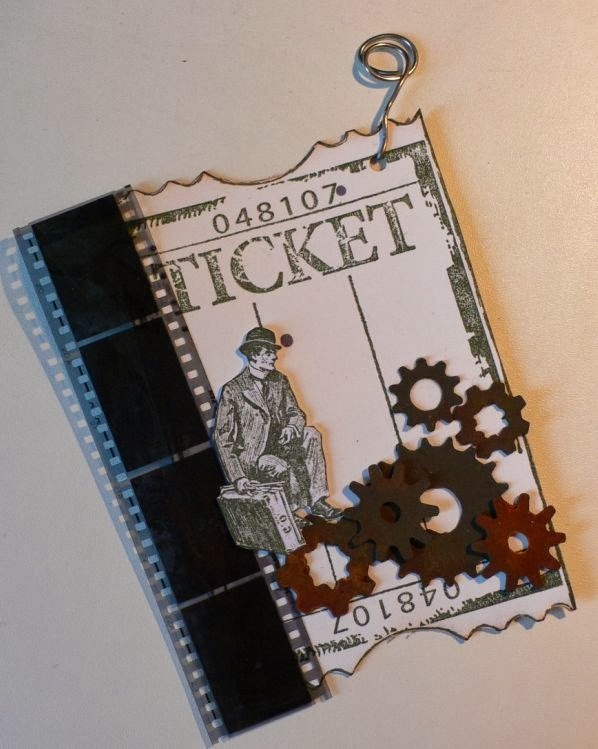 My ticket is a stamp (Artemio), I added some rusty gears (die cut), the man is a stamp (a gift from Sandee) and the stripe film is very very old (about years) I found this in an old trunk. I think it's perfect for transparency. I used two narrow acetate strips with my pop up box card to let the zeppelin and balloon fly. We hope we have inspired you to create with "Transparency" and can't wait to see your entries!